Electric Hoist-Portable Lifting Hoist Chain Hoist Wire Rope Hoist For Sale! Electric hoist mainly includes two types, wire rope hoist and chain hoist. When comparing electric chain hoists and wire rope hoists for a lifting task, customers should consider the application, environment, capacity and duty cycle. A wire rope hoist uses wire rope as a lifting element. 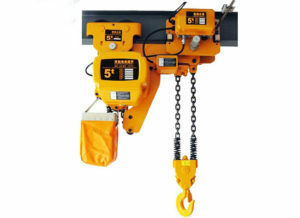 Chain hoist uses chains as a lifting element. Wire rope is wrapped around a grooved drum as it lifts, it means the wire rope follows the spiral groove on the drum and goes a little left and right as well as up. This is generally not a big deal, but in some cases where precise lifting is required this will not work. 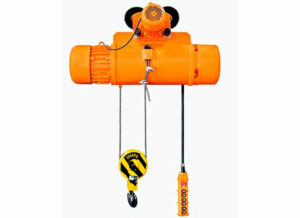 A Chain hoist lifts by pulling the chain through sprockets and depositing the chain into a chain container. This mechanism gives you the actual vertical lift and is best suitable for precise lifting requirements. Electric hoist can be used with gantry crane, jib crane, overhead crane together to expand operation area and improve working efficiency. It is mainly designed as two types, wire rope hoist and electric chain hoist. 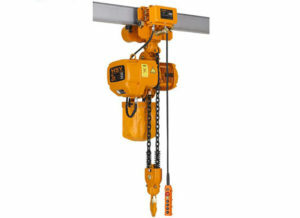 For special working conditions, customers can choose explosion-proof hoist, metallurgy hoist, low headroom electric hoist, a weatherproofing option for the use of the hoist in outdoor environment, a spark resistant option or a stainless steel option for the use of the hoist in a food grade environment. To buy a suitable hoist, customers should consider following factors, voltage or power supply (single phase or 3-phase), capacity, lift (length of chain or wire rope), suspension (hook, geared trolley, motorized trolley), pendant control length (length of push button controller), duty cycle, hoist speed, trolley speed and beam size. Contact us for AICRANE electric hoist!